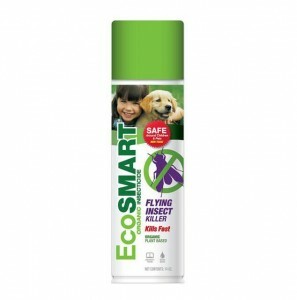 EcoSmart’s Organic Insect Repellent and Flying Insect Killer. Ok, if you’re anything like me then you might be a bit skeptical. I know I was at first. I don’t use any commercial pesticides or bug spray at my house, and deep down I was halfway convinced these organic insecticides wouldn’t work. After all, the main ingredient in the Flying Insect Killer is peppermint oil. How can peppermint oil kill wasps? Yes, I was skeptical. I’m happy to admit I was wrong. Big time. This stuff is amazing. It works, it smells fantastic, and it’s completely safe for us, our kids, our pets, and the environment. Let’s dive in and find out why this organic bug spray is so surprisingly good. The EcoSmart Organic Insect Repellent is meant to be sprayed directly on your skin to repel mosquitos, ticks, gnats, and other bugs that bite or annoy. It contains no DEET or any other synthetic chemicals. It’s 100% all natural, and uses organic plant oils. That’s it. No nasty chemicals, or anything you can’t pronounce. Impressive. You bet. I was completely amazed at how effective this bug spray was. I used it liberally last weekend while I was outside working in the yard. The mosquitos are just coming out here in Michigan, but I didn’t get bit once. And, I smelled fantastic all afternoon, like rosemary and cinnamon. I hate traditional bug spray because a) I’ve never trusted that it’s safe to put on my skin or use around my dogs and b) it smells awful. So usually, I just suffer through the mosquito swarms while I garden. But, with EcoSmart, neither of these concerns is an issue. I seriously can’t say enough about how impressed I am with this product. I also had the opportunity to use the Organic Flying Insect Killer last weekend as well, when I discovered a budding nest of yellow jackets under the roof. I’d already been amazed by the insect repellent, so I started to hope that the insect killer might work just as well. One quick spray (which sent out a wonderful peppermint/cinnamon smell that my husband could even smell from the backyard) and those yellow jackets dropped to the ground and didn’t move an inch. Want to know what’s in the flying insect spray? Seriously, I would spray this stuff in my house as air freshener if I could, it smells that good. Once you get a whiff, you’ll never go back to chemical bug killers again. Another great thing about the EcoSmart line is that because it’s all natural, it’s completely safe to use around your children and pets. One big reason why I never use commercial bug spray is because years ago, the chemicals in a commercial bug spray caused my dog, Gunther, to have a seizure. Because of this, he almost died. But I can use this bug spray around him and not to worry that he’ll be effected. The spray also doesn’t hang around for days (or weeks) like chemical sprays do. So, you don’t have to worry about your kids or your pets being effected when you’re not looking. Again, I was extremely impressed with how well this product worked, and am more than happy to be proven wrong. A glowing five out of five stars for the EcoSmart line. You can click here to go right to their website. I love the smell of the repellent but I’m sorry to report it didn’t fight off the So. Texas swarm of mosquitos! I liked the wasp spray. So sorry it didn’t work down there! Glad you had success with the wasp spray, though. Thanks for the tip. I can’t wait to try it. Do they offer a product for roaches? We have huge ones (they like to call them Palmetto Bugs, but I know it’s the same thing!) down here in So. Florida & they gross me out!!! but I hate using the traditional chemical insect sprays. One thing I found that actually works well to kill them is the GreenWorks glass cleaner (or traditional Windex)… but again, I’d love to find an alternative option to products made by Clorox. Yep, they have roach killer spray on their site! Good luck with those things! nice! thanks for the fast response. we’ve also been overrun by ants lately so this might be just the thing to get rid of all the little (and not-so-little) pests that are bugging us! I’m pretty sure you have to order it online through their website. Stores like Whole Foods might carry it, but I don’t live near one so I’m not sure! actually, they have a function on their website that lets you search for retailers near you (based on your zip code) and the closest ones to me are Wal-Mart! Whole Foods does not carry it. the location search is a small box at the top of every page. Try it out! I am planning a trip to Costa Rica in may to an eco resort. The only other post I see was the person from Texas who said this did not work. I was wondering… how did it work for you through the heavy mosquito season? Julia, I used the EcoSmart here in Michigan. The mosquitos are pretty bad, but I don’t know how they compare to Costa Rica. I was happy with how it worked. I did get bit as the summer went along, but far less than I would have if I’d have been wearing nothing at all. If it were me, I’d take the EcoSmart and perhaps have a backup of something stronger, like DEET, just in case. The Deet you can get at REI (rei.com) in smaller bottles so it wouldn’t take up that much space. I definitely wouldn’t want such an awesome trip to be ruined by mosquitoes. If you do take it along, please let us know how it worked out! Tried the EcoSmart Organic Flying Insect Killer today on a number of paper wasp nests. I sprayed directly on the wasps and many did drop, but most flew around. When I looked at the ones that fell to the ground, they were not dead, but instead spent time cleaning the oil off their wings. Someone please explain how the Peppermint Oil actually kills the wasps. From what I saw, it just oils up their wings and makes them unable to fly well. They all came back to the nests about 10 mins later. update – 2 days later and the paper wasps are rebuilding their nests. My take: the EcoSmart Organic Flying Insect “Killer” should be more appropriately names the Flying Insect “Annoyer”. I see no evidence it kills them, just irritates them temporarily. With two little ones in the the house I decided to try a more family friendly approach to killing the palmetto bugs. I sprayed the house before we left to run errands. We returned to a minty house. After a while it started to smell like a gallon of vapor rub under your nose. I saw a roach earlier and it didn’t seem fazed at all when i sprayed it. I’m with Texas the roach seemed more annoyed than anything. We will see what happens. Day one, not a fan. Well I tried the spray that you use all around the outside and inside of your home. We had crickets, ants and spiders in our home. I have a 9 month old so I wanted a product that would not hurt him. We had to buy 4 gallons costing well over $50. Our house smelled terrible for at least 3 weeks and a week after my husband sprayed it I saw crikets and ants. I don’t recommend that anyone buy this product. The people posting good reviews are obviously on the EcoSmart payroll. I had to buy the Ortho Home defense spray to get rid of the bugs and haven’t seen one since. Guess GREEN isn’t always better. DO NOT BUY THIS PRODUCT IT DOES NOT WORK. We tried the EcoSmart Insect repellent. My mother walks a lot, and today she said that more mosquitoes than usual were trailing her after she sprayed the repellent on. She didn’t get bit, but just had to swat away a lot more mosquitoes. The scent is much nicer than using products with citronella, and it’s easy to apply. But I just question the effectiveness. I wonder if neem oil works better, but I definitely won’t have fun wearing that stink. i tried the ecosmart garden insect spray to try and control cabbage loopers. the company website said that the garden insect spray would work on this pest. i have sprayed my brussel sprouts three times and it has had no effect on them. i directly sprayed a few of the worms that i hand picked off the plants and it did not kill them. i don’t know if the companies other products perform as poorly as this one but let me tell you the garden spray does not work for me. I tried the Ecosmart Insect Repellent tonight at the park. We put it on as directed and we were only out for an hour. We are covered in mosquito bites. This product is junk. Bought this earlier this summer, and just tried it. The mosquitos bit right through on the skin that was freshly sprayed. I believe the scent may have actually attracted them. We needed to leave a concert early to avoid being bitten too much. Actually wrote to the manufacturer, who was not willing to provide a refund w/o receipt…..if I still had a receipt, would have returned it! To the landfill it goes.